NeoDCP Player version 2.73 was just released. You are here: Home / Features / News / News / NeoDCP Player version 2.73 was released. NeoDCP Player version 2.73 was released. We have released a new version of NeoDCP Player. Several interesting improvements has been done. You may see a re-engineered user interface, we have updated the JPEG 2000 decoder and more. https://www.neodcp.com/wp-content/uploads/2015/05/neodcp_v2_73_main.png 483 808 Neo https://www.neodcp.com/wp-content/uploads/2013/04/logo2_07_2_0.png Neo2015-05-15 22:02:012015-05-15 22:57:52NeoDCP Player version 2.73 was released. 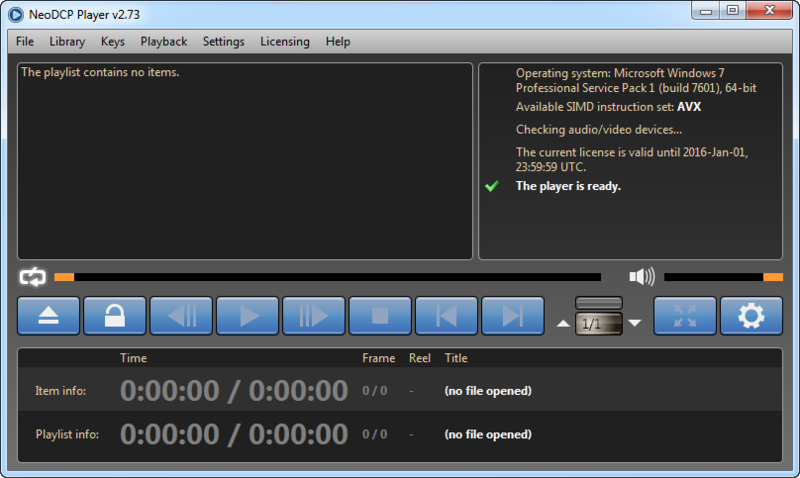 Review of NeoDCP Player by Jason Bowdach from Cinetic Studios NeoDCP Player version 2.74 is out. Read more here.